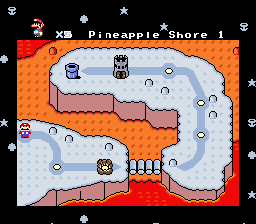 "Mario wakes up in an old cabin on an island. He goes out to explore, with little recollection of any past events. However, he very quickly notices something...awry. Structures are in ruin. 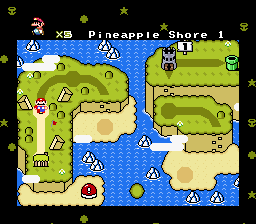 The land is overrun with trees, grass, and shrubbery. And no one is to be seen. Nice hack here. 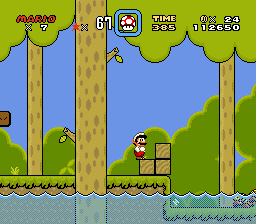 I finished your demo and i noticed some problems with layer 3 (the water follow the player, this is bad). 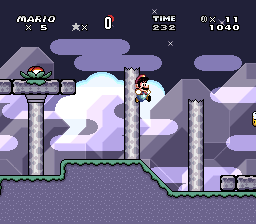 I believe that the colors of the caves scenery could improve, but it's optional. 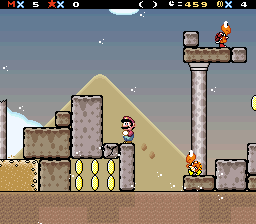 First, this is just a suggestion, but seeing that you're aiming for a choconilla aesthetic style, you should play around more with palettes: coins & blocks, sprites, Mario or even the status bar. 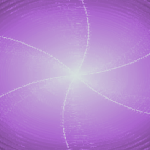 Most choconilla hackers do this and the results are quite pretty. I honestly don't see how this is supposed to look good. You used the same palette for the fg & bg plants. Try making a darker one for the bg plants. 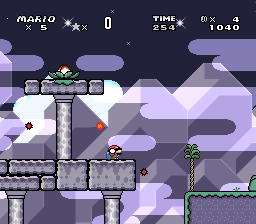 The grass and trees' shade is way too bright, again try making that specific color a bit darker, and while you're at it make all the bg darker, it looks a bit strange. 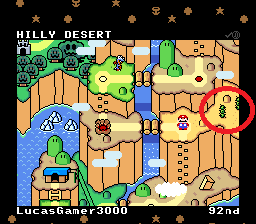 Actually the trees' shade is way too bright too, but if memory serves smw's original tree palette is like that too, so meh. It's hard to get this Dragon Coin without taking a hit. 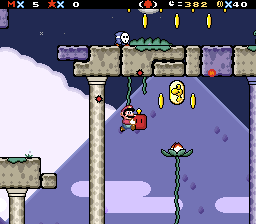 I'm sure you can evade this chuck and make him break the blocks, but even so this is kinda cheap for a world 1 level, specially since so far the hack's difficulty is easy-normal. 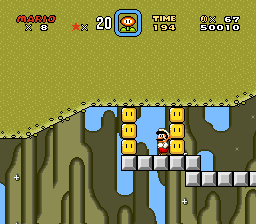 Then again this situation could be avoided, but it isn't exactly hard to get trapped here. 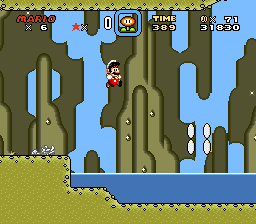 The water tides, uh... Why are they there? They dind't affect any of the two levels you used them other than avoiding pitch deaths, and if this was your objetive then water tiles can do the job. 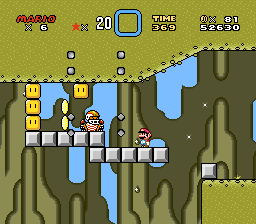 But of course having them just as decoration isn't bad, but vertical scrolling makes them look REALLY bad. 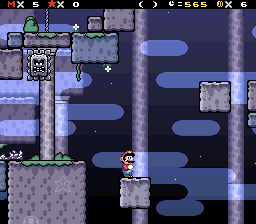 You can either remove them or disable vertical scrolling (this might work for the forest level but you'd still have to redesign certain parts tho). And last but not least, the slowdown. 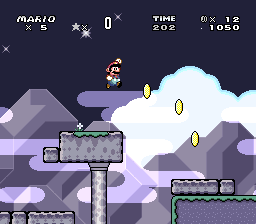 I did get some slowdown playing on snes9x. 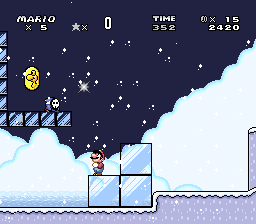 FastROM should fix this, read lm's documentation in case you don't know how to enable it (keep in mind that you'll have to port to a clean rom before doing so). 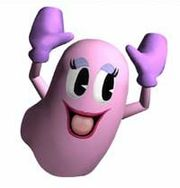 I hope this helps you. Good luck with this! 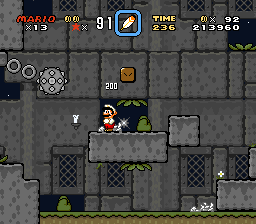 This chuck enables a flying koopa generator when hit, but it won't do anything when not. 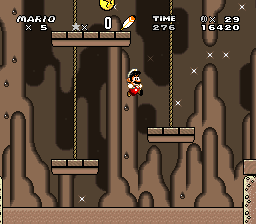 I did jump on him the first time thus enabling the generator, but I'm sure a lot of people will just skip him, and not to mention that the goal tape is just ahead and this generator is kinda easy to evade if you're running. This could be used in a very clever way, but as it is right now it isn't. 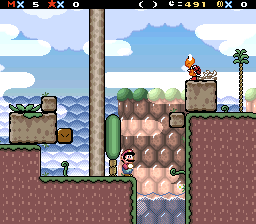 Just replace him with any other sprite. ehhhhh. 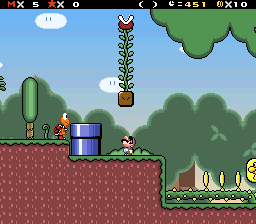 rather than darken it i'd say maybe raise the saturation and/or brightness on the fg plants a bit? not too much since it's a really murky color scheme and it would stand out if you went too far, but i think it would do good. 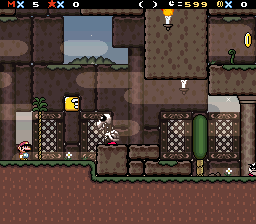 It's gonna be an underground level for World 2, Choco Desert. I just started on it, which is why it looks so empty. 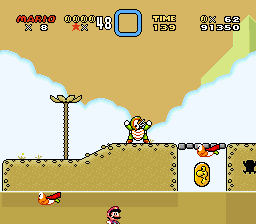 The sand outline has way too much contrast compared to the ground. 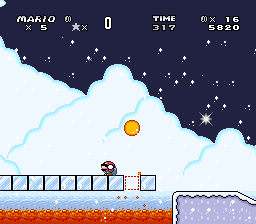 New world here, generic ice/fire world. Clearly not finished. 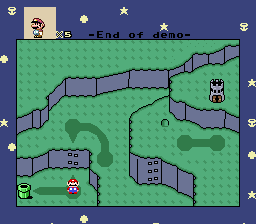 Basically, the way this will work is that all of the main worlds are submaps, and the main overworld is where all the special worlds will go (I know it's backwards but bear with me). 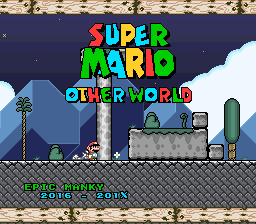 My plans may change, but currently I'm looking at 6 main worlds and 4 special worlds. But aren't those Flowers and Cacti from VLDC9? Well...yes and no. They're clearly inspired by the flowers from VLDC9, but the pattern that they move in is different. I was planning on changing them to make them look more original, since I shouldn't be using them without permission, anyway. 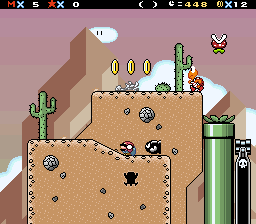 And as for the cacti, I drew them myself to resemble the ones in Choco Desert. 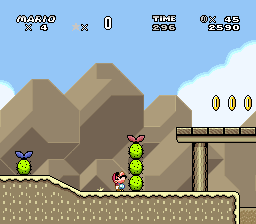 And I don't recall seeing any cacti in VLDC9...could you show a screenshot or something? 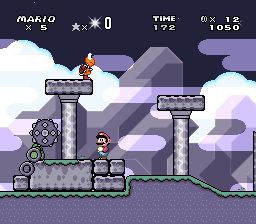 Commenting on the latest screen, I'd recommend making the BG palette a bit less similar to the FG, it's not exactly confusing but a bit boring to look at right now. 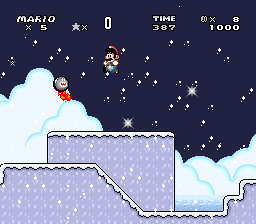 Well, i used some VLDC9 GFX too, so i can shut up lol. Also just played the Demo, not bad so far! 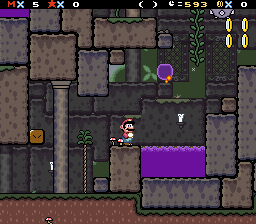 Working on a new submap for Grape Ruins! 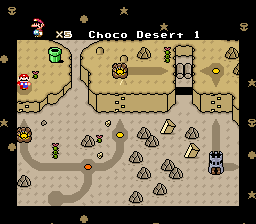 Choco Desert is just about complete, aside from the extra level, Choco Secret. 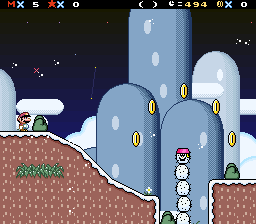 I've also been working levels for Vanilla/Cinnamon Tundra, as well as the overworld. 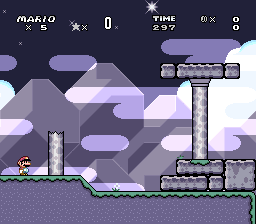 Progress is a bit slow, but I like to think it's coming along nicely. 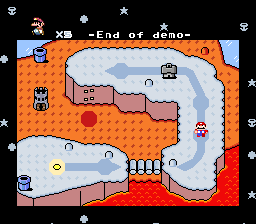 Also, here's the Vanilla Tundra map. 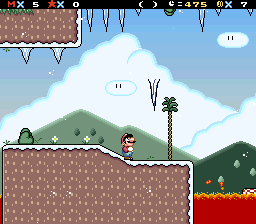 I'm not sure what to do with the lava and ice, but they'll be staying where they are for now. 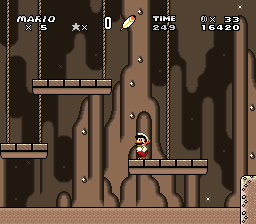 A lava river level might be cool. 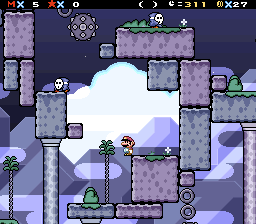 I'm still working on decorations and enemy placement, which is why it's so empty. 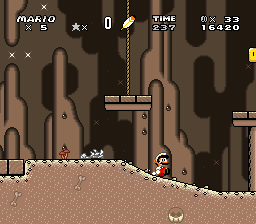 Also, this level has lightning flashes, as well as this song playing. Yay for gloomy atmospheres! 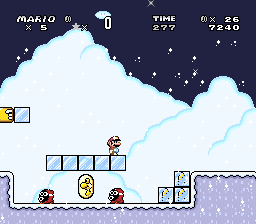 Shy-guy's palette is weird, as well as ice blocks's transparency. 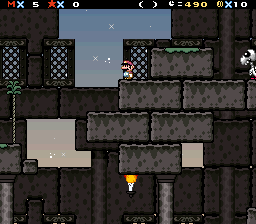 I've also been thinking about giving levels unique level names instead of the generic "Grape Ruins 1" or whatever. What do you guys think?